This weekend, 15 16 & 17 February the University of Nottingham will be taking over 140 athletes to Sheffield to compete for the #GreenandGold at BUCS Nationals. The athletes will be competing in swimming, athletics, judo, fencing, karate, climbing and badminton. We caught up with our Sports Injury Clinic physiotherapist, Rory, who will be supporting the athletes to reach their personal best over the weekend. What is it like to work at BUCS Nationals as medical staff? 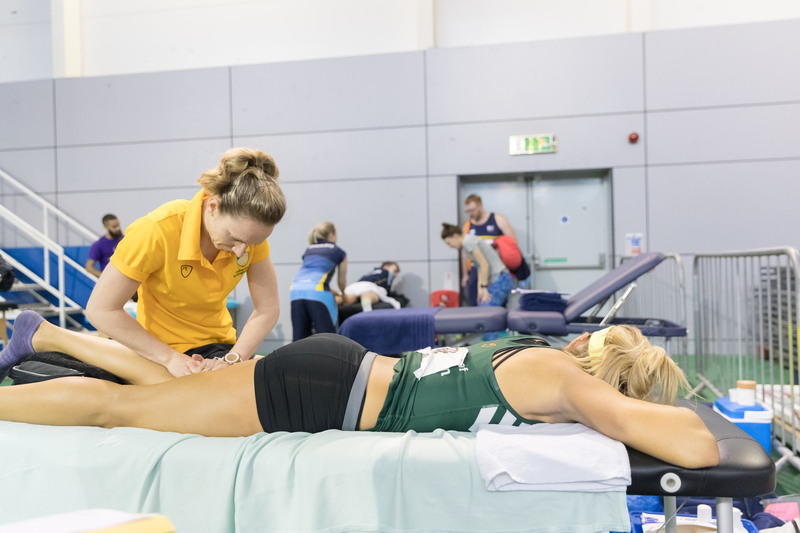 “In my experience attending BUCS nationals for the past 2 years, providing medical support at BUCS Nationals events has been a good blend of challenging but very enjoyable and rewarding. I work within the Sports Injury Clinic which means there is typically structure and order to your schedule whereas events such as BUCS Nationals can closer resemble controlled chaos given the unpredictability of the weekend. A typical day involves being the first person in and the last person out as you need to be in to set up before the first event and close up after the last event when all the athletes are done for the day. What support do the athletes require over the weekend? “The usual suspects typically involve pre event taping or strapping, pre event soft tissue treatment such as massage and then post event treatments to aid with quick recovery before their next event which could be later that day or the following day. This can get more or less intense as they weekend goes on depending on how many are still competing in the final events on Sunday, however even if there is less athletes, they tend to need more treatment and support as they have competed over a number of days. A significant part of the support we provide revolves around educating athletes on how they can self-manage e.g. foam rolling or stretching techniques, warm ups ideas, managing rest between events, hydration, nutrition etc. However to most athletes this presumably sounds more like a nagging mother: “What have you eaten?” “Have you had enough water?” “Make sure you try get a nap before your next event!” “Don’t go eating junk food!” It’s important to make sure athletes are well supported and doing the right things to positively impact their performance, in a pressure cooker environment like BUCS nationals it’s equally important to remind them to enjoy the event atmosphere whilst keeping an eye on often over looked things like stress levels and anxiety. What have you been up to the week leading up to Nationals? “The week leading up to the event is just as important as the event itself. This is where the ground work and preparation for the event is done and where you can get a step ahead of any potential injuries going into the event. The objective is to try to be proactive with how athletes manage their injuries and not simply react to injuries on the day as by then it’s too late in most cases. The week will be made up with assessing athletes who may have “niggles” going into the event and planning ahead of how we can manage during the event. This allows us to ideally know what athletes to keep tabs on and pre plan their treatment and weekend schedules. As helpful as this is for us organize and prioritize our time and resources, it’s equally helpful for the athlete as it provides structure and reassurance in what is often already a stressful and anxious time for them. What do you enjoy most about working at BUCS Nationals? “What I look forward to most in these events is seeing the results of a year’s hard work not just from the athletes but also the long list of support staff be it the medical team, strength and conditioning team, the coaches, the club development team. Being able to see that as a sports division, we played an important part in allowing the athletes to fulfill their potential in their given sport is what is most rewarding and at the end of the day is why we all work within the University sports department. As a medical team, we would be like to be the least busy people at the event but this unfortunately rarely the case, injury plays a big part in competitive sport. This is even more relative for athletes who compete over all 3 days whether that be heats to finals or over multiple disciplines. You can follow the University of Nottingham’s progress in the BUCS Nationals on our Twitter, Facebook, Instagram and also here. There will also be regular updates on the BUCS official website and social media channels.